WELL LOVED AND IN VERY GOOD CONDITION. Rugged molded fiberglass construction with built-in 500 lb. swamped buoyancy. Powered by a SABB (Norway engine mfr. – not Swedish SAAB automobile mfr.) 6-8 HP, one cylinder, 4 stroke diesel engine with fresh water cooling via an integral pump. 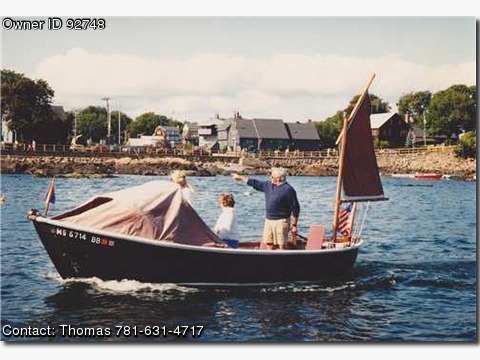 Boat is steered by tiller and has a mizzen mast with sail for stability when required. Comfortable cruising speed is 6-8 knots. Has 2:1 built-in gear reduction and clutch for integral variable pitch propellor. Boat seats 4-6 persons comfortably but can carry 10- 12 if required. There is ample varnished woodwork in the interior of the boat. Boat is fully found with a 15 lb. anchor on chain and rope rode, several fenders, six new life jackets, several cushions, a dodger, automatic electric bilge pump, and an auxiliary hand operated high-volume bilge pump, running lights, an electric horn, several penant staffs, docking lines, boat hook, paddle, and a fold- out solar panel to keep battery charged.